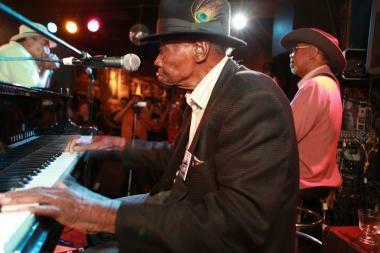 LOGAN SQUARE — Rosa’s Lounge is keeping the blues alive in Chicago, according to a prestigious award set up to honor promoters and documentarians of the classic music genre. The Keeping the Blues Alive award was given to the Logan Square blues lounge Jan. 23 at a recognition ceremony in Memphis, Tenn., where a variety of 14 global blues outlets, from festivals to journalists and radio DJs, were honored. “This is a great honor and a privilege, so I would like to give thanks to The Blues Foundation in Memphis and Karl Maurer for the nomination letter,” Rosa’s owner Tony Mangiullo posted on Facebook before listing many more thank you notes. Of the iconic blues clubs scattered across the country, Rosa’s Lounge stands uniquely off the beaten path, reads a full Blues Foundation profile of the 30-year-old blues bar. "Rosa’s maintains the high quality of yesterday’s generation of Chicago blues and is thought of as home by many in the Chicago blues community." The Blues Foundation presents the KBA Awards to individuals and organizations that have made significant contributions to blues music, according to the foundation’s website. The honors are awarded by a select panel of blues professionals to those working actively to promote and document the music.